Throughout this trip, I encountered many difficult questions that I have been struggling to answer. After three weeks of exploring Berlin, meeting with local activists, visiting museums, and attending walking tours, I find myself only a little closer to understanding their answers. More often than not, my experiences have left me with new questions, wishing I could spend more time in Berlin. On my final day in the city, I would like to consider these questions and reflect on how my recent experiences have allowed me to more critically examine them. I hope to apply what I have learned in the course and continue furthering my understanding of identities, forms of oppression, and memorials. First, I want to consider our navigation of identities and subjectivities. How do we see ourselves and acknowledge how others see us? This question has helped me reflect more deeply on my own positionality and how society chooses to perceive it. In the spaces I have been welcomed into during this trip, it was important for me to understand how my own experiences exist in relation to the experiences of others. Having a greater awareness of this has better enabled me to listen critically and appreciate the narratives people share. Therefore, I discovered that my primary role ought to be that of a curious listener. 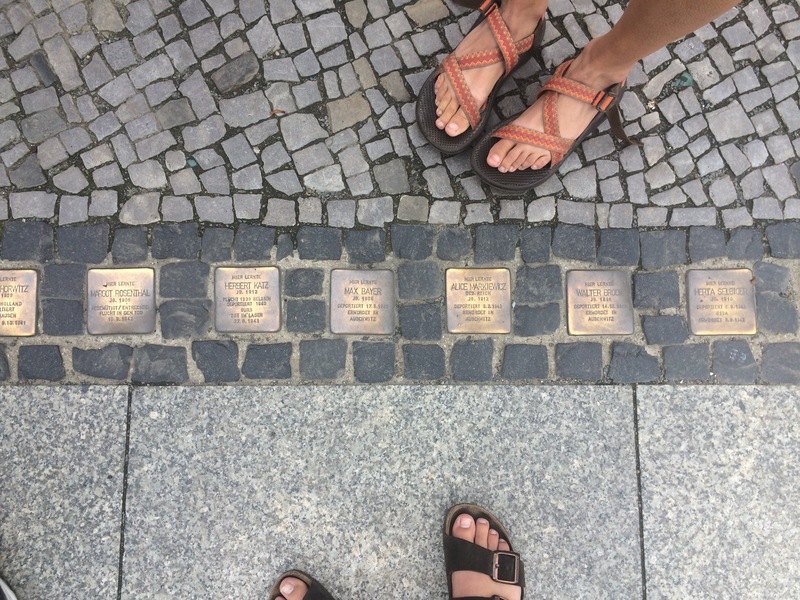 This blog serves as an extension of this curiosity and as an ongoing attempt to understand the marginalized communities of Berlin and my role in it. After speaking with local activists, I began to question how and when people decide to confront forms of oppression and when they choose to affirm or challenge stereotypes. These questions reminded me of our “Rethinking Masculinities” panel and our discussion with Post-War Generation Black German Women. Spending time with Black and Turkish activists in Berlin has allowed me to better understand how individuals chose to deal with racism and sexism. While each experience is unique to the individual, it was clear that in their navigation of public space, they are never divorced from activism. As Musa Okwonga plainly stated, “You’re Black all the time in Berlin.” And although it is the Afro-German’s right not be discriminated against and exhibit self-determination, they must to spend their life in opposition to racism. They are not getting paid to spend their time confronting oppression, yet the burden so greatly lies on them. How people choose to confront different forms of oppression also reminded me of our discussion with Salma Arzouni about their work with Gladt and SAWA. I felt that Salma consciously and efficiently navigated what needed to be achieved in their own fight against racism and sexism. Although it is exhausting work, it seems as if they effectively prioritize their goals when trying to combat oppression in a community. As someone who works day and night to support queer communities in Berlin, Salma has to carefully decided how to spend their time. They described the sacrifices they had to make in order to achieve their short-term initiatives. For example, instead of spending their time arguing with the local government at the risk of receiving cuts to Gladt’s government funding, Salma decided to temporarily halt a particular kind of political activism. For the sake of Gladt, Salma now chooses to spend that time helping queer people secure a permanent place to live. While this achievement might not seem monumental to some, it is life-changing for those people who now have a place to sleep at night. Additionally, after visiting many museums and memorials, I hope to gain a greater understanding of how certain histories have been told. I personally need to take more time to consider who writes these stories. More specifically, I want to understand the implications for those who speak for themselves and those who are being spoken for. Also, it was important for me to learn more about what groups of people were involved in the creation of Jewish memorials. I was curious if Jewish-Germans often gave input on their construction and who decided what to include in it. As Sabine Offe writes in “Sites of Remembrance? 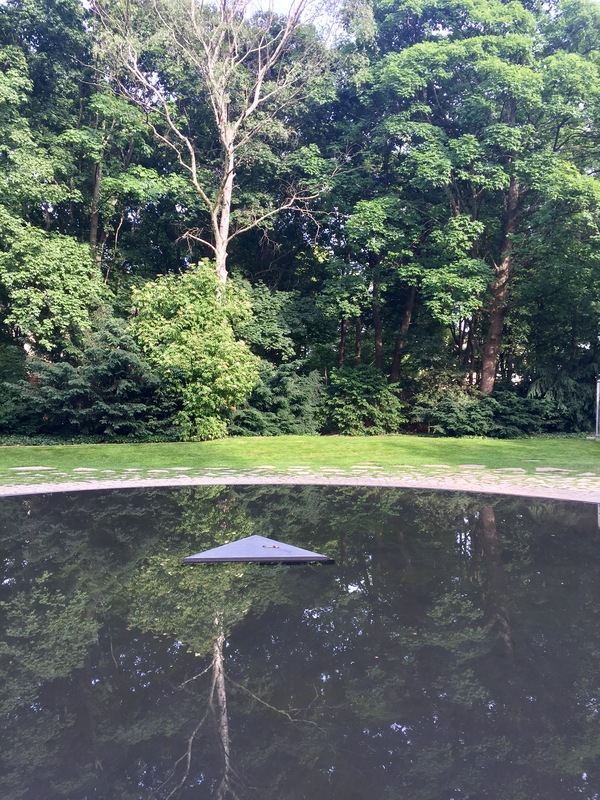 Jewish Museums in Contemporary Germany,” “We do not know whether individuals, confronted with the obligation to remember, do indeed remember what they are supposed to” (79). 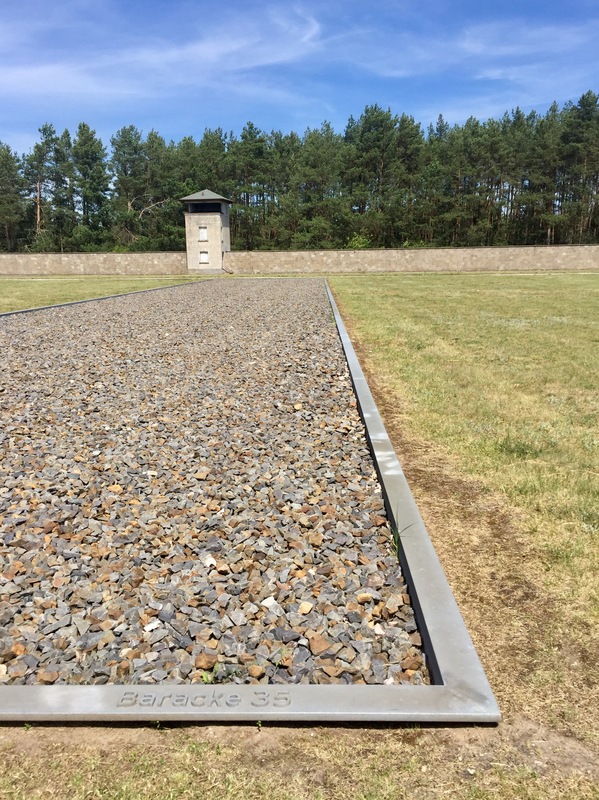 However, while some forms of remembrance can be more accurate than others, figuring out a way to accurately commemorate an event such as the Holocaust is beyond complicated and nearly impossible to accomplish. As a result, I am reminded of the importance of looking at historical sites more critically. This causes me to further question how we decide to honor a community that is not monolithic. For instance, I hope to better understand how a memorial can erase the individual experiences of a population. As R. Ruth Linden describes in “Troubling Categories I Can’t Think Without: Reflections on Women in the Holocaust,” a generalized representation of a group of people “fails to be accountable to lives that are actually lived: situated in bodies with limited means of making sense of…world-historic events in which they participate as…cultural subjects” (27). As a result, this adds another layer to the complexities of memorials and how people choose to represent communities. I hope that we more often attempt to honor the experiences of individuals since it can be easy to erase these differences when trying to honor an entire group. 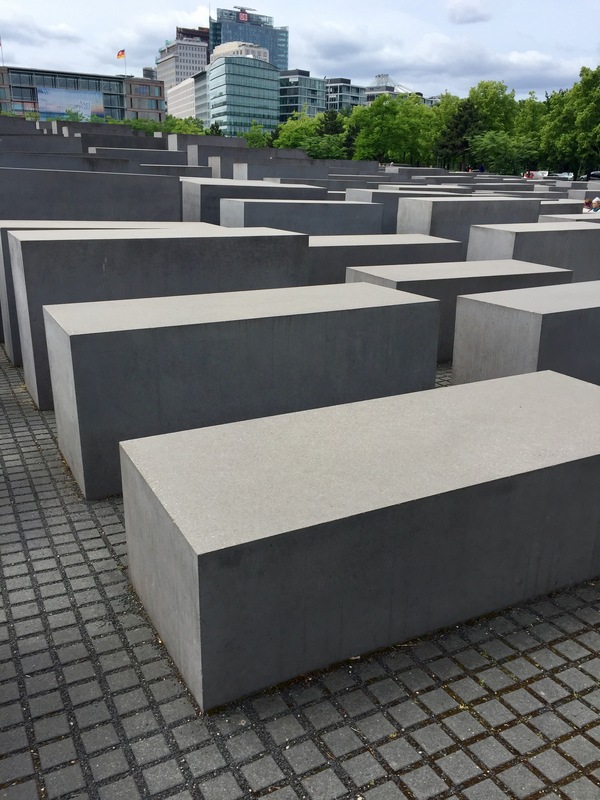 Unlike most of the Jewish memorials, there were two important instances during our trip where I noticed groups of people deliberately telling their own story: the Friedrichshain-Kreuzberg (FHXB) Museum and the Roma and Sinti Historical Walking Tour. The FHXB Museum exhibit was a collaborative piece that the local community came together to create. They directly told the history of the district where generations of their own families grew up. I felt this participatory exhibit was representative of strong community relationships and also much more effective in the telling the histories they chose to portray. Additionally, the Roma and Sinti walking tour did much of the same work. The Roma high school students who led the tour self-organized and researched all the material presented. Further, when I asked the students what their parents thought about the tours they were giving, they responded, smiling: “Our families are very proud.” The energy and passion the students exhibited on the tour I feel could have been easily lost if non-Roma and Sinti people led it. Lastly, after three weeks of listening to and engaging with marginalized people in Berlin, I am left wondering how I can take what I have learned out into the world. Firstly, I hope to do this by recognizing the importance of going beyond academic work. While reading and discussing articles and books are beneficial in developing a basic understand of the material, the practical application of Feminist and Gender Studies outside the classroom is a hard-fought war. By spending time both inside and outside the classroom, I feel as if I can most effectively support marginalized communities and become more consciously aware of their situation. As Sidonia Blättler and Irene M. Marti describe in “Rosa Luxemburg and Hannah Arendt: Against the Destruction of Political Spheres of Freedom,” if people understand the complexities of human relationships, this subsequently “drives them toward solidarity with outcasts and emboldens them to a collective struggle against the oppressors” (89). I feel my future goal must be to join this collective struggle. By knowing my place and understanding my own identity in relation to others, I feel as if I can do this and support marginalized groups in their fight against forms of oppression. 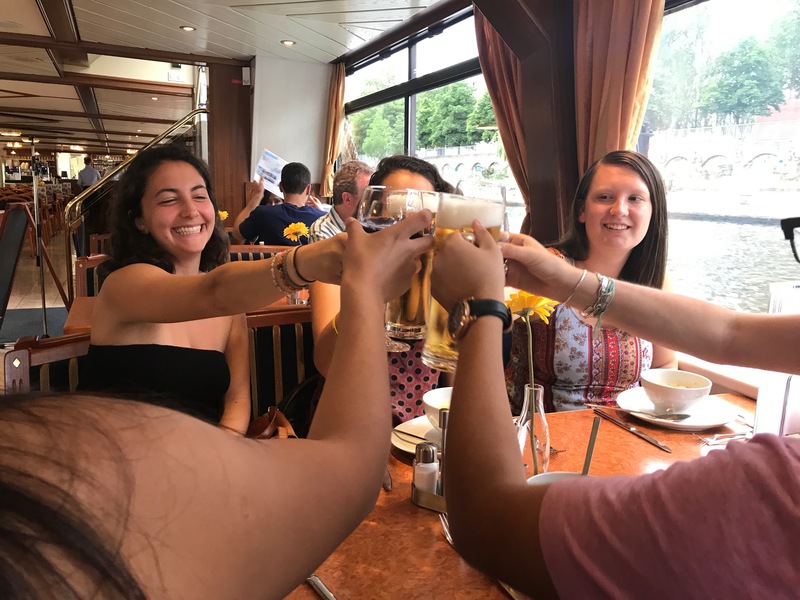 Click here to view a slideshow, and follow us on Instagram and Twitter to see even more pictures and videos! To read and/or listen to the finales and view the indices and slideshows for previous FemGeniuses in Berlin, click here. Annie Zlevor is a rising junior from the shores of Lake Michigan in Racine, Wisconsin. She is an Organismal Biology & Ecology major and a Feminist & Gender Studies minor. Annie is also a pre-medicine student, and hopes to attend medical school. In her free time, Annie enjoys eating Lebanese food, going fishing with her family, and taking lots of naps. Currently, you can find her spending some time outside the lab learning about Berlin’s hidden histories. 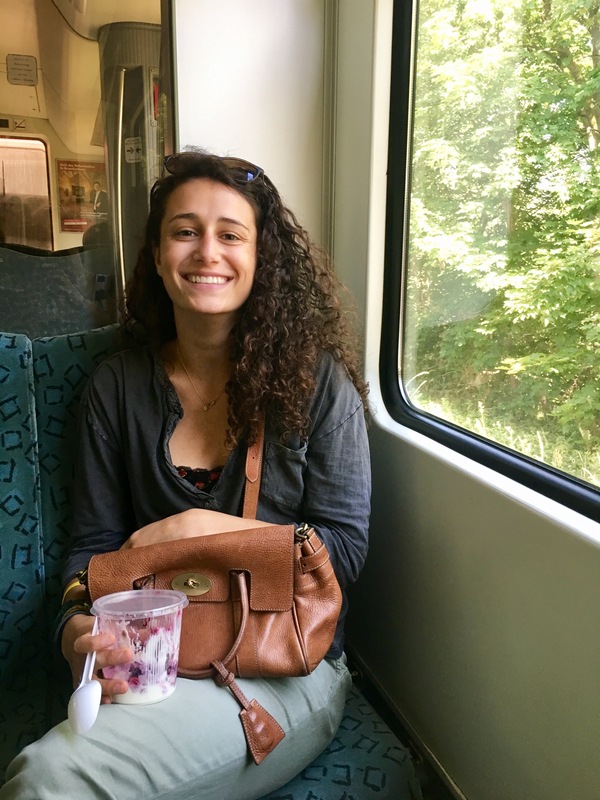 She is excited to be exploring Germany for the first time and hopes you enjoy reading about her experiences. As I’ve spent the past week navigating this city, there’s one thought I can’t seem to shake: What might this moment feel like if I was standing on this street 80 years ago? Last Tuesday started in frantic bus-catching and bus-missing. Nora and I thought we planned out a calm morning of café musings and decedent parfait, only to find out that we were busless at 9:10 am and 25 minutes away from a 9:30 am walking tour about Jewish History and Culture with Carolyn Gammon. Some disgruntled words were exchanged (none too disgruntled that we couldn’t laugh about it later) and by 9:38 we found ourselves running to our classmates. I managed to avoid eye contact with Heidi for a full 30 minutes. In all that time spent frantically searching for a means of transportation, I hadn’t taken time to prepare myself for what I was about to experience. A “Jewish History Tour w/ Carolyn Gammon” our syllabus read. 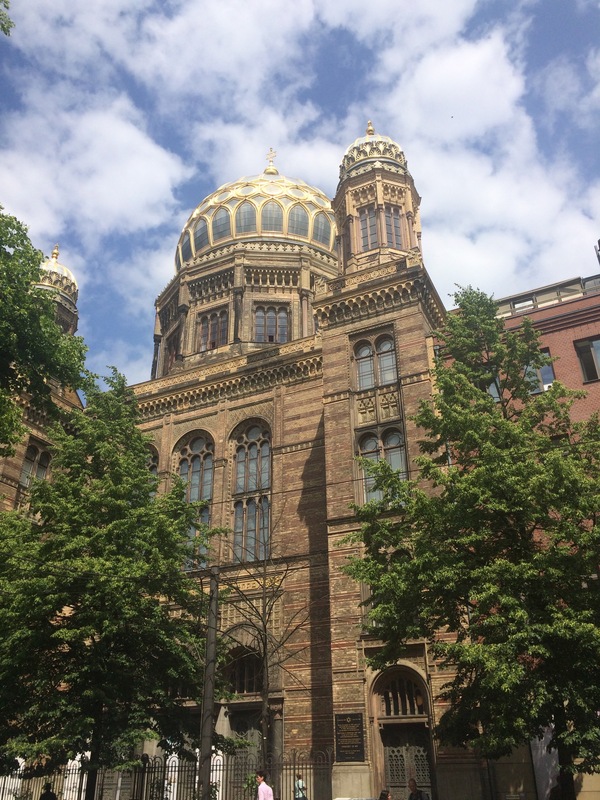 A Jewish History Walking tour in the capital of Germany. As Gökçe Yurdakul and Y. Michal Bodemann aptly put it, Germany “is the last country in which Jews would want to live” (2006). It was exactly this haunting memory that attracted me to Germany this summer. For most of my life, I have admittedly harbored some prejudice against all things German: German cars, German music, even German beer. I wanted to confront that prejudice head on, and collide I did. Last Tuesday, arriving at the Jewish History Tour w/ Carolyn Gammon sweating and panicked from the public transportation fiasco, I didn’t allow myself to process what I now have the luxury of processing. I knew on some level that Tuesday would not simply be a stroll around Berlin pointing and discussing history. It was a history of me, my ancestors, their murders and murderers. It wasn’t until I was standing on Bebelplatz in front of the Humboldt Universität Law School doors, the very place that Joseph Goebbels, Reich Minister of Propaganda for the Nazi party, stood on the evening of May 10, 1933 burning thousands of books, that it struck me. As Carolyn spent a few minutes recounting that evening, all I heard were the cheers of thousands of young people as book by book were tossed carelessly into the fire. I could hear those same cheers as Jew by Jew were tossed carelessly into the fire pits of Auschwitz II-Birkenau. Could anyone else hear the cheers? 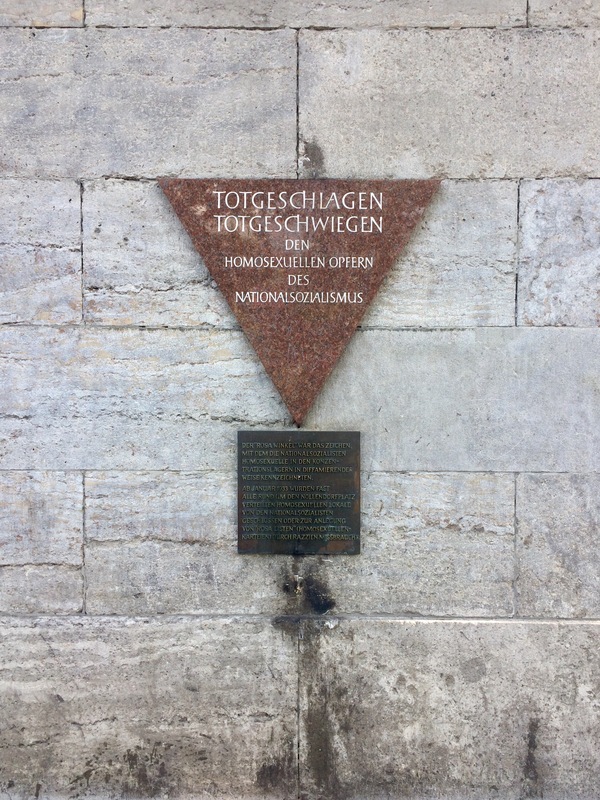 I tried to hold in whatever it was that so desperately needed to come out in that moment until I saw the memorial to the book burning, set into the Bebelplatz plaza created by Micha Ullman. It was an empty room full of empty bookshelves to hold the souls of the 20,000+ books burned that night on Bebelplatz. Emptiness. So often the modus operandi for holocaust memorials. From that moment on, I could no longer hold back my tears. 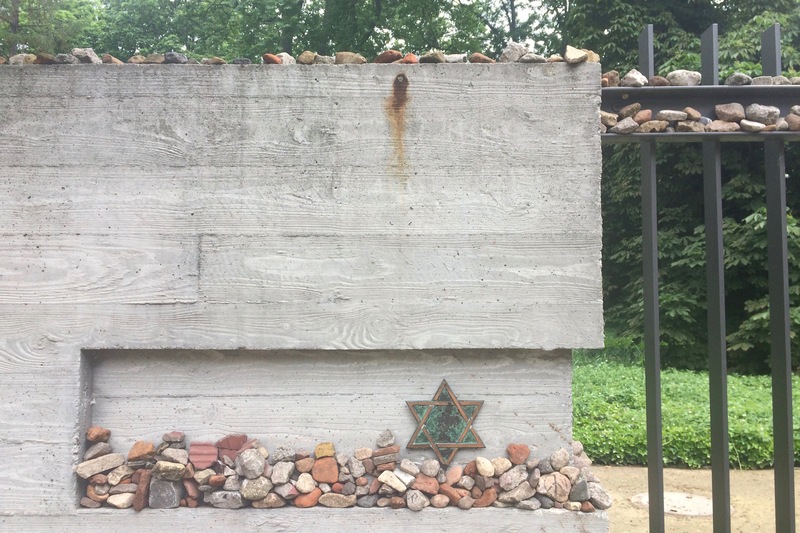 We continued to Grosse Hamburger Strasse Cemetery, a Jewish cemetery that holds no bodies. Dug up and thrown out as if they were weeds to be cleared, the plot of land was the only piece of them remaining. I needed to mourn but didn’t know how. I felt so young and so lost. In a cemetery with no bodies, I left with a bigger pit in my stomach than any other cemetery had ever left in me. I then decided to devote some time to the Jewish museums we passed earlier on our tour. The Silent Heroes Memorial Site is tucked away in a graffiti-filled alley way just outside Hackesher Markt. The front door is easy to pass by in the whirlwind of color and activity in this small alley, but worth the stop. When I walked in, the person sitting behind the desk looked confused. “Are you open?” I peeped. Their face relaxed, “Yes.” It doesn’t seem as if this museum gets many visitors, but it’s purpose and message are vital to the Jewish history of Berlin. The museum is not huge or particularly “gaudy;” it is a simple database collecting as much information as possible about the “Hidden Heroes” of the Holocaust—the people who risked their lives, the lives of the friends and family, to save a few Jews. I sat down at a long table covered in new-agey computers. I typed in the only name I could think of: “Oskar Schindler.” There he was, and there was Emilie. This free space holds troves of information, and I would recommend anyone who has time between their alternative graffiti tour and Berlin history walking tour to pop in. Fittingly, immediately to the right of the Silent Heroes museum lies a silent hero. The Museum of Otto Weidt’s Workshop for the Blind, another equally small space, holds some of the actual workbenches for blind Jews who worked in his shop. Otto Weidt was able to hide and protect blind Jews (himself a partially blind German) for a large portion of the war. In the museum, there’s a picture hanging behind one of the workbenches. It’s a photo of about 30 or 40 people, all blind Jews expect for a little Otto in the bottom right corner. Some of the people have a number correlating to a key on the side with their name and fate after the war. Most were killed in Auschwitz. Some didn’t have a number. I took a moment to mourn for them. Friday evening, 30 minutes to Shabbat, I boarded the 245 bus to Oranienplatz. I walked past hostel bars and Asian-fusion restaurants, past loud American tourists and quiet panhandlers, until I reached the one building slightly out of place, a massive ornate building proudly sporting a Star of David atop its picturesque dome. The Neue Synagogue. I walked up a red carpet to a metal detector. I showed my passport and purse while a woman skirted around me. “Good shabbis,” she smiled as she disappeared into the next room. My soul filled. I entered the synagogue, now museum, and continued up three flights of huge marbled stairs. I found a sign that pointed right, “synagogue,” picked up a tallit and prayer book, and found myself in a very small very plain-looking room. It didn’t seem to match the ornateness of the outside. I received a few more good shabbis and sat down in the back. I was one of eleven. Forty minutes into the hour service that I remembered where I was. I remembered that I was the stranger in the room. Being the stranger suddenly felt okay, almost comforting, because I wasn’t, we were all Jews and all shared a common language. As I walked out, I asked the young man behind me what it’s like to live in a place so saturated by the history of the Holocaust. He laughed—laughed! Nikki Mills hails from the swampy Washington, D.C. area, and treasures the moments she gets to spend in sunny Colorado. She’s an Anthropology major and Political Science minor, but in an effort to leave her comfort zone and still explore issues close to her heart, she’s chosen to take her first official Feminist & Gender Studies course this summer. 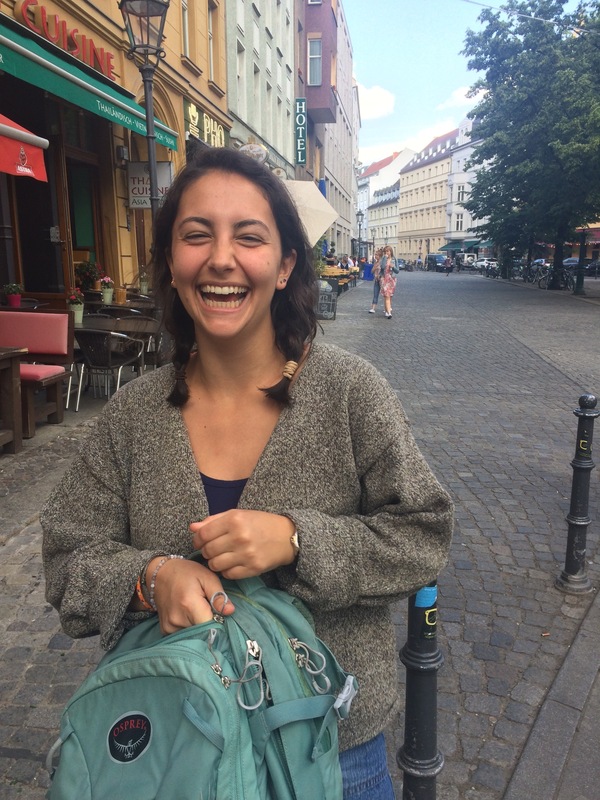 On campus, Nikki can be found hanging from ropes in the climbing gym and attending Shabbat dinners at the Interfaith House. Throughout school and beyond, she hopes to continue working hard for the disregarded in our society and find creative ways of moving past this particularly vile moment in U.S. history.